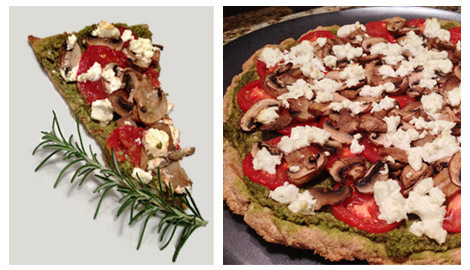 Leanne’s Classic Pesto and Pizza with a Creative Twist | Audio and video stories from Southwest Washington. For some reason there is an unwritten rule assumed by many individuals that healthy eating means completely abstaining from certain foods, such as pizza, for the rest of one’s lifetime. It is no wonder then that these same individuals are also apprehensive of ever eating better. While pizza has the stigma of being the ultimatum evil junk food, we cannot throw out the baby with the bath water and forget that we have incredible personal freedoms. Creatively modifying recipes is a favorite adventure and freedom which I enjoy, as the reward is a brilliant win-win situation in which delicious meets nutritious. Life is far more flavorful when we choose to both receive and share forward the gift of health through the many win-win freedoms available to us, which is just one of many reasons why the word “celebrate” is included in my business name Celebrate Nutrition. I most certainly am not giving up pizza for the rest of my life and since chances are that you are thinking the very same thing, allow me to share an early Christmas present with you. Below is my newly developed recipe for classic pesto with a deliciously, healthy twist using the most nutrient rich herb on one of America’s favorite foods—pizza! While I love a good marinara tomato sauce, you are in for an extra special treat by simply mixing up your standard pizza recipe with the secret ingredient of mouthwatering pesto. Biases aside, this is the most delicious pizza recipe I have ever experienced. Dive into a new culinary adventure below with this soon-to-be recipe favorite and enjoy its delightful, disease preventative benefits. Blend all ingredients in a food processor. Spread onto a baked pizza crust (see crust recipe below). Add desired pizza toppings. My favorites, as shown in the picture here, are goat cheese, fresh sliced tomatoes, and mushrooms. Creative Tips: Pesto is extremely versatile and may be used for a hundred plus other purposes, including on a “pasta” dish using grated zucchini spirals instead of the whole-grain pasta, spread on crackers, as vegetable dip, or my favorite, stuffed into mushrooms. Mix the non-dairy milk with apple cider vinegar and let it sit a few minutes for a quick and flavorful homemade buttermilk. Add this mixture to a bowl with the remaining ingredients—flour, baking powder, sea salt, and melted coconut oil. Knead until just mixed. Spread onto a baking sheet and bake for 13 minutes at 425F. Top baked pizza crust with desired pizza ingredients and bake for an additional 30 minutes.